It's coffee o'clock. The intense aroma of fresh ground coffee makes the mysteriously dark brew more tantalizing than ever. This rich scent of your favorite coffee wafting through the house can get you out of bed. Once you wake up and taste this unbeatable flavor of freshly ground beans, it's hard to get back to sleep! You can NOW indulge, every morning, in a hot brew made of freshly ground coffee, with our premium quality, manual burr coffee grinder. The aroma and flavor of home-ground beans are better than the pre-ground version every time and this burr grinder truly grinds, allowing a fuller unlocking of the chemical compounds stored within the bean. This hand conical burr coffee mill has many different levels of grind, which can be chosen to make sure that you unlock the optimum flavor in your preferred brewing method. 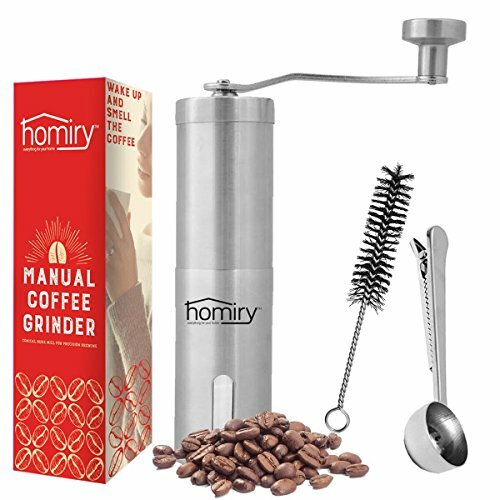 When you find yourself on the go and in need of your own grinds, look no further than this portable, easy to clean and carry manual coffee grinder. Our PRECISION coffee mill is designed to grind with perfect accuracy without any power supply. It's made from stainless steel material, which makes it easy to clean and virtually indestructible. Because, even on the go, coffee and love should be fresh and hot! Only Available To Certified Coffeeholics. GRIND IT FRESH: Whole bean coffee ground right before brewing helps to protect the natural flavors of the coffee from being exposed to the environment and becoming bland and stale. For a coffee that is a hug in a mug, try our ceramic burr manual coffee grinder. Adjustable, with over 18 click settings, it's suitable to grind coffee for various brewing systems. BEST TRAVEL COFFEE GRINDER: Attention coffee lovers: you can now enjoy luxury coffee moments when travelling. This amazing portable hand crank mill can be easily carried and used everywhere you go. You need zero power supply to use the freshest ingredients for your coffee and with this quiet coffee grinder, you no longer need to worry about your camping neighbors. QUALITY MAKES THE DIFFERENCE: Coffee mills are not all created equal. Our ergonomic coffee grinder is easy to use and leaves you with a precise and consistent grind. It provides uniform size of ground particles, assuring full aroma brew, and it has a steady and comfortable grip, made from a stainless steel material. All these characteristics make it the best manual coffee grinder you can find in the market. POWERFUL COFFEE LOVER GIFT: If your friend's checklist starts with "Drink coffee", provide him or her with an entire manual grind experience choosing our product. The gift box will include not only our precision conical burr coffee mill, but also a bonus travel bag, a cleaning brush and a coffee scoop with bag clip, which you get for free. Other people pay MONEY for this stuff. If you have any questions about this product by Homiry, contact us by completing and submitting the form below. If you are looking for a specif part number, please include it with your message.